Do you want icing on your cake? The question is often asked as to whether silage inoculants are needed when the weather is good, or is it just when the weather is poor? 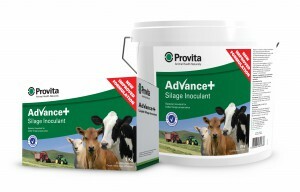 Provita Advance+ is like the icing on top of the cake, silage will be even higher in sugars and nutritional quality in good weather conditions. Advance+ is a unique 3 strain product containing 2 lactic acid producing strains and 1 acetic acid producing strain. When applied at the recommended rate it supplies a guaranteed minimum of 1.2 million cfu per g of forage at point of application. The Lactobacillus plantarum and Pediococcus pentosaceus strains give rapid lactic acid fermentation and the Lactobacillus brevis converts some lactic acid to acetic acid. The strains work together to give the benefits of a traditional rapid lactic fermentation plus improved stability. Advance+ can therefore be used in forages of all levels of dry matter plus in a wide range of crops including grass, wholecrop and maize. Advance+ is available in liquid and granular form. The ready to use granular product is available in 20kg tubs that treats 50 tonne and is applied at 400g per tonne treated. The 1 kg powder to liquid box treats 100 tonnes of grass. Advance+ liquid is a ready to use product and can be applied at standard 2L per tonne treated down to 40ml per tonne.